I purchased this in cream recently. It came fairly quickly. It is a nice bedskirt and makes my room look much cleaner. I would recommend for covering all the junk under the bed. Give your bed a tailored, finished look with the timeless 400-Thread-Count Cotton Drop Bed Skirt. Constructed with split corners in a rich assortment of colors, the bed skirt completes your bedding ensemble with sophistication. 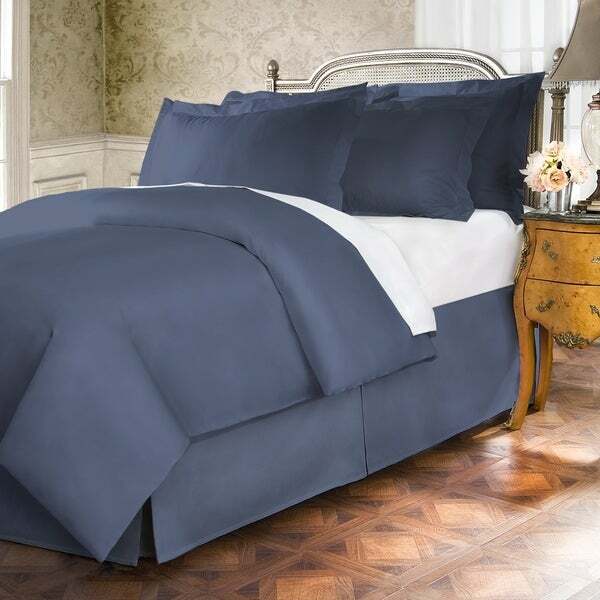 This collection is a super soft luxurious 100% cotton sateen. The bed skirts come in twin 39x75 inches, full 54x75 inches, queen 60x80 inches, king 78x80 inches, and cal king 72x84 inches. The bed skirts are available in an 18 inch drop length for higher profile beds or those utilizing bed risers. The program comes in a fabulous collection of colors that include blue jean, canvas, charcoal, ivory, merlot, silver, and white white. Dimensions 84.0 In. X 72.0 In. X 18.0 In. There's not a ton to say about a bed skirt, is there? This one met my expectations exactly. I'm thankful that the white color I selected is not see-through. Nice lines. Simple design. I love this pleated cotton bed skirt. I laundered it and ironed the skirt and it looks fabulous on my bed!. I like the 18 inch drop because I have the bed on risers so I can store things underneath. It's perfect. It was the right length and the navy is a dark navy not a gray blue navy color which it looked like in the picture. It still worked for me. This drop bed skirt has such a beautiful deep gray color and is perfectly cut. I love the way that it hits each corner and gives the bottom of the bed a squared-off shape rather than the ruffled look that you see a lot with the majority of bed skirts. It’s soft to the touch and light weight. The color is just what I wanted. Beautiful bed skirt with perfect drop length for this bed! Happy with this purchase! Love this bed skirt. Nice and heavy not poorly made. I have a king bed that I use a bed step with and it has just the right amount of drop. Washes great dries easily. Fine. Doesn't wrinkle and seems to be working out fi e.
Fits perfectly. Keeps its shape. Looks and fits great. Don't tug-to-center it though - it tears at the seam VERY easily. So soft ! Some sections of threading are poking out ( approximately 5-6 washes ) but that's a minimal problem . Love the fact that this bedskirt has a longer drop to hide the bed frame and the fact that it has a 400 thread count. Good quality especially for the price! The color of this bed skirt is very dark navy, unlike the picture on the website. A very nice tailored bed skirt, fits perfect! "I see the 'red' bed skirt is listed as "Wine", and the shams/pillowcases are listed as "Merlot". Is the Wine and Merlot color the same color? I'm looking at getting a matching bed skirt with the shams. Thank you!" Yes this is the same color. "Do you offer the pillowcases and / or euro shams for purchase separately? (I'm looking to purchase the bed skirt + 2 matching pillowcases)"
"The previous question was answered and the answer makes no sense. The question was referring to the color choice "Blue" for which there is no picture. The question was what type of blue is it closest to? Royal, Aqua etc... The answer was that the product was charcoal not blue? Pretty sure they are not all charcoal, hence the color choices. So again...what type of blue is it? Or better yet...how about a picture of the blue color choice?" There is not a photo of the "blue" option because there is no "blue" option, this was included by mistake. We are working on correcting this and apologize for the confusion. "Does anyone know what type of blue the Blue color is? There's no picture for it. Is it a baby blue, royal blue, aqua blue?? Be nice if they could provide pics for all the colors." This product is charcoal, not blue. "Does it have split corners?" Yes, this has split corners. "Does this bed skirt have split corners"
Size and color fit what I needed and was what I had been looking for. How to Use a Bedskirt from Overstock.com. Our guides provide customers with information about how to use a bedskirt. A bed skirt is an ideal way to add extra style and function to your bedding decor. Keep reading to learn how to buy a bed skirt. How to Install a Bedskirt from Overstock.com. Our guides provide customers with information about how to install a bedskirt.